1,363 patented drug products for human use were reported to the PMPRB, including 103 new drug products. 5 Voluntary Compliance Undertakings were accepted. $2.79 million in excess revenues were offset by way of payment to the Government of Canada, in addition to price reductions. 1 Notice of Hearing was issued in the matter of the price of Soliris. There were $13.7 billion in sales of patented drug products in Canada in 2014, an increase of 3.1% from 2013. 59.6% of the total drug sales in Canada were for patented drug products, a decrease from 60.7% in 2013. Prices of patented drug products were stable, while the Consumer Price Index rose by 2.0%. Canadian prices were 3rd highest among the seven PMPRB comparator countries, lower than prices in Germany and the US. $739.2 million in total R&D expenditures were reported by patentees, a decrease of 1.8% over 2013. $658.7 million in R&D expenditures were reported by Rx&D members, an increase of 1.0% over 2013. I have the pleasure to present to you, in accordance with sections 89 and 100 of the Patent Act, the Annual Report of the Patented Medicine Prices Review Board for the year ended December 31, 2014. 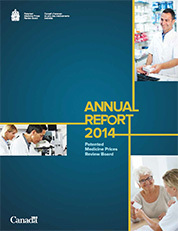 I am pleased to present the PMPRB’s 2014 Annual Report. This year we have updated our format, adopting a more user-friendly design highlighting the PMPRB activities and emphasizing important trends. As Canadians, we find ourselves facing tough questions of how best to ensure continuing access to cost-effective drugs. Our population is aging just as a wave of promising new high-cost drugs are entering the market, adding strain to already stretched health-care budgets and forcing payers to make increasingly difficult choices. The Patented Medicine Prices Review Board (PMPRB), a consumer protection agency with a dual regulatory and reporting mandate, plays a unique role in this evolving landscape. The PMPRB’s regulatory mandate is to ensure that the prices of patented medicines sold in Canada are not excessive. Its reporting mandate is to provide stakeholders with information on the latest trends in pharmaceutical sales and pricing and on pharmaceutical research and development (R&D) spending in Canada. In terms of its regulatory mandate, during the 2014 reporting period, the PMPRB entered into Voluntary Compliance Undertakings (VCUs) following investigations into the pricing of five patented medicines, resulting in $2.8 million in excess revenues being paid to the Government of Canada by pharmaceutical patentees. In 2014, the PMPRB also commenced a hearing into the price of the patented medicine Soliris, the first such proceeding since 2012. In terms of its reporting mandate, in addition to the publication of its Annual Report, in 2014, the PMPRB published the inaugural edition of its NPDUIS annual CompassRx report. This flagship report is the first of its kind to identify major drivers behind changes in prescription drug expenditures in public plans in Canada. The information contained in this report, along with other NPDUIS studies, will assist pharmaceutical payers and policy makers in making informed reimbursement and pricing choices. Through its unbiased reporting, the PMPRB is contributing to the broader discussion, preparing Canadians, from drug plan managers to consumers, for important decisions that lie ahead. Canada and the European Union have reached a complete text of the Comprehensive Economic and Trade Agreement (CETA). Its implementation will require amendments to the Patent Act to provide pharmaceutical patentees with up to two years of additional market exclusivity. Such a change would come at a time of high drug prices and record low R&D, causing some to question the effectiveness of the PMPRB and whether a policy balance conceived over 25 years ago continues to serve its intended purpose. In light of these questions, in 2014 the Board initiated a year-long strategic planning process in an effort to chart a fresh course for the next quarter century that would see the PMPRB reaffirm its consumer protection origins. The strategic priorities that resulted from that effort are set out in the PMPRB’s 2015–2018 Strategic Plan. As I embark on my fifth and final year as Chairperson of the PMPRB, and tenth as a Board member, I am confident that the careful execution of these priorities in the coming years will enable the PMPRB to build on its prior successes and emerge from this period stronger and more effective than at any time in its almost three decade-long history. The PMPRB was created in 1987 as the consumer protection “pillar” of Bill C-22, legislation which also strengthened the patent rights of pharmaceutical manufacturers in order to spur investment in research and development (R&D) in Canada. The PMPRB protects consumers by regulating the price of patented drugs at the factory gate level and by keeping a vigilant eye on pricing trends and industry R&D. Through our reporting function, we serve as an objective, centralized source of information on pharmaceutical trends for policy makers, drug companies, private insurers and other stakeholders. that administers provisions of Canada’s Patent Act related to patented medicines. As a member of the Health Portfolio, we contribute to a sustainable health-care system for all Canadians. 1,363 patented drug products were reported to the PMPRB in 2014. The Patented Medicine Prices Review Board (PMPRB) is an independent, quasi-judicial body established by Parliament in 1987 under the Patent Act (Act). The PMPRB is a consumer protection agency with a dual regulatory and reporting mandate. Through its regulatory mandate, it ensures that the prices of patented medicines sold in Canada are not excessive. The PMPRB also reports on trends in pharmaceutical sales and pricing for all medicines and on research and development (R&D) spending by patentees. In particular, through the National Prescription Drug Utilization Information System (NPDUIS) initiative, the PMPRB provides pharmaceutical payers and policy makers with information to make rational, evidence-based reimbursement and pricing decisions. Canadian consumers are symbolically represented by a graphic of a generic male and female in the centre of a segmented circle. 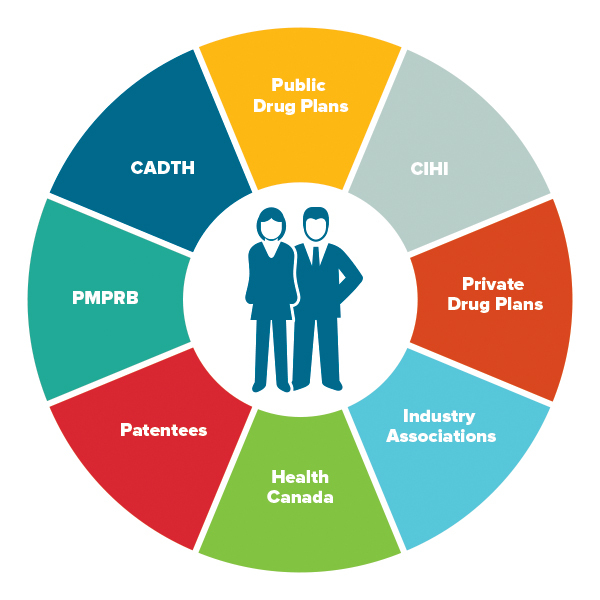 Each segment of the circle represents an organization or category of organizations that are part of the Canadian pharmaceutical environment: Public Drug Plans; CIHI; Private Drug Plans; Industry Associations; Health Canada; Patentees; PMPRB; CADTH. The PMPRB is part of the Health Portfolio, which includes Health Canada, the Public Health Agency of Canada, the Canadian Institutes of Health Research and the Canadian Food Inspection Agency. The Health Portfolio supports the Minister of Health in maintaining and improving the health of Canadians. Although part of the Health Portfolio, because of its quasi-judicial responsibilities, the PMPRB carries out its mandate at arm's length from the Minister of Health, who is responsible for the sections of the Act pertaining to the PMPRB. It also operates independently of other bodies such as Health Canada, which approves drugs for marketing in Canada based on their safety, efficacy and quality; federal, provincial and territorial public drug plans, which approve the listing of drugs on their respective formularies for reimbursement purposes; and the Common Drug Review, administered by the Canadian Agency for Drugs and Technologies in Health, which recommends drugs that should qualify for reimbursement by participating public drug plans. The PMPRB is composed of Board Staff, who are public servants responsible for carrying out the organization’s day to day work, and Board members, Governor-in-Council appointees who serve as panel members in the event of a dispute between Board Staff and a patentee over the price of a patented medicine. The PMPRB regulates the "factory gate" prices for all patented drug products in Canadian markets; that is, the prices at which patentees (companies) sell their products to wholesalers, hospitals, pharmacies and other large distributers. The PMPRB has no jurisdiction over prices charged further along the supply chain, e.g., wholesale prices or retail prices charged by pharmacies, nor does it have the authority to regulate the prices of non-patented drugs. The Board's jurisdiction is not limited to drug products for which the patent is on the active ingredient. Rather, the Board's jurisdiction also covers drugs for which the patents relate to, but are not limited to, the processes of manufacture, the delivery system or dosage form, the indication/use and any formulations. Under the Act, patentees are required to inform the PMPRB of their intention to sell a new patented drug product. Upon the sale of a patented drug product, patentees are required to file price and sales information at introduction and, thereafter, until all patents pertaining have expired. Although patentees are not required to obtain approval of the price before a drug is sold, they are required to comply with the Act to ensure that the prices of patented drug products sold in Canada are not excessive. Board Staff reviews the prices that patentees charge for each individual strength and form of a patented drug product. If Staff believes that the price of a patented medicine is excessive, it will first try to reach a consensual resolution with the patentee. Failing this, the Chairperson can hold a hearing on the matter. At the hearing, a panel composed of Board members acts as a neutral arbiter between Board Staff and the patentee. If a panel finds that the price of a patented medicine is excessive, it can order a reduction of the price to a non-excessive level. It can also order a patentee to offset any excess revenues and, in cases where the panel determines there has been a policy of excessive pricing, it can double the amount to be offset. The PMPRB reports annually to Parliament through the Minister of Health on its price review activities, the prices of patented medicines and price trends of all prescription drugs, and on the research and development (R&D) expenditures reported by pharmaceutical patentees, as required by the Act. Through the National Prescription Drug Utilization Information System (NPDUIS) initiative, established by the federal, provincial and territorial (F/P/T) Ministers of Health in 2001, the PMPRB conducts critical analyses of price, utilization and cost trends for patented and non-patented prescription drugs. This program provides F/P/T governments and other interested stakeholders with a centralized, credible source of information on pharmaceutical trends. The Board consists of up to five members who serve on a part-time basis. Board Members, including a Chairperson and a Vice-Chairperson, are appointed by the Governor-in-Council. The Chairperson is designated under the Act as the Chief Executive Officer of the PMPRB, with the authority and responsibility to supervise and direct its work. The Members of the Board, including the Chairperson, are collectively responsible for the implementation of the applicable provisions of the Act. Together, they establish the guidelines, rules and other policies of the Board as provided by the Act and consult, as necessary, with stakeholders including the provincial and territorial Ministers of Health and representatives of consumer groups and the pharmaceutical industry. Mary Catherine Lindberg was first appointed Member and Vice-Chairperson of the Board in June 2006. On May 19, 2010, Ms. Lindberg assumed the powers and functions of the Chairperson while the office was vacant. She was officially appointed Chairperson of the Board on March 3, 2011. From 2002 to 2009, Ms. Lindberg was Executive Director of the Ontario Council of Academic Hospitals, an organization of 25 Academic Hospitals that are fully affiliated with a university and its Faculty of Medicine. Previously, she was the Assistant Deputy Minister, Health Services, with the Ontario Ministry of Health and Long-Term Care. Her responsibilities included the Ontario Health Insurance Plan (OHIP) and the Ontario Drug Programs. Ms. Lindberg has a degree in pharmacy from the University of Saskatchewan and holds a pharmacist license in both Saskatchewan and Ontario. Dr. Mitchell Levine was appointed Member and Vice-Chairperson of the Board on March 3, 2011. Dr. Levine is a professor in the Department of Clinical Epidemiology & Biostatistics and the Department of Medicine, Division of Clinical Pharmacology in the Faculty of Health Sciences at McMaster University in Hamilton, Ontario. He is also Director of the Centre for Evaluation of Medicines at St. Joseph's Healthcare in Hamilton. Dr. Levine received his medical degree from the University of Calgary and did postgraduate medical training in Internal Medicine and in Clinical Pharmacology at the University of Toronto. He received an MSc degree in Clinical Epidemiology from McMaster University in 1988. He is a practicing consultant physician in Hamilton, Ontario. Prior to his appointment to the Board, Dr. Levine had been a member of the PMPRB's Human Drug Advisory Panel. He presently acts, on an ad hoc basis, as a clinical pharmacology consultant to the Ontario Ministry of Health and Long-Term Care. He is the Editor-in-Chief of the Journal of Population Therapeutics And Clinical Pharmacology and the Canadian Journal of General Internal Medicine. Normand Tremblay was appointed Member of the Board on May 31, 2012. Mr. Tremblay teaches at the Université du Québec in the area of management, project management and innovation. He brings to the Board a vast experience and expertise in strategic and operational planning and organizational development. For over 20 years, Mr. Tremblay has been active in various areas of the business field, both nationally and internationally. He has also sat on investment committees and a number of administrative boards, including the National Research Council of Canada from 2007 to 2010. Mr. Tremblay holds a master’s degree in project management (MSc) with a specialization in best practices in product development from the Université du Québec à Trois-Rivières as well as a certificate in business governance from Laval University (2009), and is a Certified Management Consultant. He is also a member of the Order of Certified Administrators of Québec. Richard Bogoroch was appointed Member of the Board on December 13, 2012. Richard M. Bogoroch is the founder and Managing Partner of Bogoroch & Associates LLP, the successor to Bogoroch and Associates, a Toronto-based law firm established in November 1999 that specializes in civil litigation. Bogoroch & Associates LLP concentrates on serious personal injury litigation, wrongful death litigation, medical malpractice litigation, products liability and disability claims litigation. Mr. Bogoroch graduated from McGill University with a B.C.L. in 1978 and a LL.B in 1979. He was admitted to the Alberta Bar in 1980 and called to the Ontario Bar in 1983. Richard completed his articles at Thomson Rogers and in 1983 joined the firm upon his call to the Bar. In 1993, he was certified by The Law Society of Upper Canada as a Specialist in Civil Litigation. From 1987 to 1999, he was a partner at Thomson Rogers. Mr. Bogoroch is a past Director of the Ontario Centre for Advocacy Training and a past Director of the Advocates' Society. He is also a past Chairman of the Canadian Bar Association – Ontario Provincial Committee on the Judiciary. Mr. Bogoroch has lectured and written extensively on many aspects of personal injury litigation for Continuing Legal Education Programmes organized by The Advocates' Society, The Law Society of Upper Canada, the Ontario Bar Association, the Ontario Trial Lawyers Association, The Canadian Institute, Osgoode Hall Law School's Professional Development Programme, Insight and others. Since 1999 he has also been a guest instructor at the Intensive Trial Advocacy Workshop at Osgoode Hall Law School. From 2011 to 2014, he has chaired or co-chaired Osgoode Professional Development's annual programme on personal injury litigation. Since 2011, he has co-chaired the Advocates' Society "Tricks of the Trade Programme", its annual continuing legal education programme on personal injury litigation. Mr. Bogoroch has been recognized by LEXPERT as a Leading Practitioner in Personal Injury Law and was listed in "Best Lawyers" for Personal Injury Litigation. Carolyn Kobernick was appointed Member of the Board on June 13, 2014. Carolyn Kobernick is a lawyer and former career public servant. Prior to her retirement in 2013, Ms. Kobernick had been Assistant Deputy Minister of Public Law for the Department of Justice since 2006. As principal counsel to the Minister of Justice and Attorney General of Canada, Ms. Kobernick was instrumental in the development and delivery of policy for the Public Law sector. In addition to identifying key strategic, legal and operational matters, she tackled cross-cutting national issues as the liaison between the Department of Justice and other government organizations. Ms. Kobernick joined the Department of Justice in 1980 where she practiced litigation and tax law at the Toronto Regional office. In 1991 she was appointed Senior General Counsel, Deputy Head, Business and Regulatory Law Portfolio, after working for over a decade in the legal services unit of the Correctional Service of Canada. In her role as Senior General Counsel, Ms. Kobernick was involved in complex policy and operational issues affecting the Government of Canada, including the Alaska Pipeline and Mackenzie Valley Pipeline files and the Sponsorship file. During her career with the public service, Ms. Kobernick actively participated in many high-profile initiatives. She was Chair of the National Legal Advisory Committee and Departmental Champion for Aboriginal People and Gender Equity, and was appointed Senior Legal Advisor to the Government of Canada for the 2004 Gomery Inquiry. Ms. Kobernick holds a B.C.L. and L.L.B. from McGill University and is a member of the bar of Ontario. In 2012 she obtained a Certificate in Adjudication for Administrative Agencies Boards and Tribunals from the Osgoode Hall Law School and The Society of Adjudicators and Regulators. 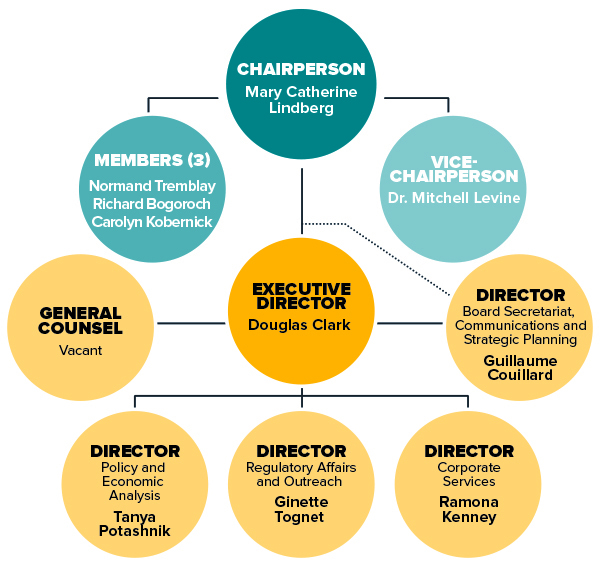 This organizational chart illustrates the high-level reporting structure within the PMPRB, and lists the current Board and Senior Staff members. Board: Chairperson—Mary Catherine Lindberg; Vice-Chairperson—Dr. Mitchell Levine; Members—Normand Tremblay, Richard Bogoroch, and Carolyn Kobernick. Senior Staff: Executive Director—Douglas Clark; General Counsel—position is vacant; Director Board Secretariat, Communications and Strategic Planning—Guillaume Couillard; Director Policy and Economic Analysis—Tanya Potashnik; Director Regulatory Affairs and Outreach—Ginette Tognet; Director Corporate Services—Ramona Kenney. The Executive Director is responsible for advising the Board and for the leadership and management of the Staff. The Regulatory Affairs and Outreach Branch reviews the prices of patented drug products sold in Canada to ensure that they are not excessive; encourages patentees to comply voluntarily with the Board's Guidelines; implements related compliance policies; and investigates complaints into the prices of patented medicines. This Branch also informs and educates patentees on the Board's Guidelines and filing requirements. The Policy and Economic Analysis Branch provides advice on PMPRB policy issues, including recommendations on possible changes to the Board's Guidelines. It conducts research and economic analysis on pharmaceutical trends, and provides information to support both compliance and enforcement. Through the NPDUIS initiative, it provides targeted analyses of drug price, utilization and cost trends to support public drug plan managers and other key decision makers in Canada. The Corporate Services Branch provides advice and services relating to human resources management; facilities; health, safety and security; information technology; and information management. It is also responsible for financial planning and reporting, audit and evaluation, and liaising with federal central agencies on these topics. The Board Secretariat, Communications and Strategic Planning Branch develops and manages the PMPRB's communications program, media relations, public enquiries and the formal complaints process; manages the Board's meeting and hearing processes, including the official record of proceedings; and coordinates activities pursuant to the administration of the Access to Information Act and the Privacy Act. It is also responsible for strategic planning and reporting. The General Counsel advises the PMPRB on legal matters and leads the prosecution team in proceedings before the Board. In 2014/15, the PMPRB had a budget of $10.927 million and an approved staff level of 73 full-time equivalent employees. * The Special Purpose Allotment is reserved strictly for external costs of public hearings (legal counsel, expert witnesses, etc.). Any unspent funds are returned to the Consolidated Revenue Fund. The Communications Program is responsible for planning and managing the PMPRB's external and internal communications activities. One of its goals is to generate meaningful dialogue between government, industry stakeholders, Canadian consumers and the media on pharmaceutical issues, and to strengthen the PMPRB’s relationships with these groups. To that end, the Communications Program is taking a more proactive approach to its media presence. Over the past year, this included a greater use of press releases and engagement with media outlets generally. In addition, the PMPRB revamped its website, increased its use of social media and developed new publication products targeting a more general audience. It continued to respond to public enquiries and inform the public through publishing updates of Board proceedings and decisions, and research results. The PMPRB is committed to ensuring that industry stakeholders are consulted and informed of changes in the operating environment and are promptly advised of any updates to the regulatory process. Over the past year, the Regulatory Affairs and Outreach Branch continued to provide regular outreach sessions for patentees, reorganized the web pages relevant to patentees and created its first instructional video. The PMPRB is a reliable, impartial source of comprehensive information on drug prices and trends. In addition to regular publications, such as the Annual Report and the quarterly NEWSletter, the PMPRB publishes the results of analytical studies including NPDUIS research papers. This year, the PMPRB committed to publishing an Analysis Brief in conjunction with the release of each new NPDUIS report to highlight the main findings of the study for a more general audience. The PMPRB also organized a researchers’ forum with academics and policy experts to discuss current research into pharmaceutical use in Canada and emerging areas for future study. With the population aging and using more prescription drugs—and sometimes more expensive types of drugs—Canada’s spending on pharmaceuticals is expected to increase significantly in the years to come. Medical advancements have introduced many innovative new drugs to the Canadian marketplace to improve existing treatments and to treat conditions that previously had no pharmaceutical therapy. These include high-cost orphan drugs, biologics and cancer drugs. The PMPRB plays an important role in regulating the prices of new and existing patented drug products to ensure the sustainability of the Canadian health-care system. Since 2010, approximately 2% of new drugs reported to the PMPRB were catagorized as breakthrough drugs. A breakthrough drug product is defined as the first drug product to be sold in Canada that effectively treats a particular illness or effectively addresses a particular indication. In 2014, there were 61 investigations into excessive drug pricing. As a result of PMPRB investigations, five Voluntary Compliance Undertakings were accepted (up to May 31, 2015), with over $2.7 million in excess revenues offset by way of payment to the Government of Canada. In January 2015, a Notice of Hearing was issued to determine whether the patented medicine Soliris, a high-cost “orphan” drug, is excessively priced in Canada. Proceedings are ongoing. The PMPRB protects the interests of Canadian consumers by ensuring that the prices of patented medicines sold in Canada are not excessive. It does this by reviewing the prices that patentees charge for individual patented drug products to wholesalers, hospitals and pharmacies and by taking action against patentees to reduce prices and pay back excess revenues where appropriate. Patentees are required by law to file information pertaining to the sale of their drug products in Canada. The Patent Act (Act) along with the Patented Medicines Regulations (Regulations) set out the filing requirements, and Board Staff reviews the pricing information on an ongoing basis to ensure that the prices are not excessive until all patents pertaining have expired. There are several factors used for determining whether a drug product is excessively priced, as outlined in section 85 of the Act. The Compendium of Policies, Guidelines and Procedures (Guidelines) details the price tests used by Board Staff to determine whether the price charged by a patentee falls within the maximum allowable price. The Guidelines were developed in consultation with stakeholders including the provincial and territorial Ministers of Health, consumer groups, and the pharmaceutical industry. When an investigation determines that there is a problem with the price of a patented drug product, the patentee is offered the opportunity to voluntarily lower its price and/or refund its excess revenues through a Voluntary Compliance Undertaking (VCU). If the patentee disagrees with the results of the investigation and chooses not to submit a VCU, the Chairperson of the Board may issue a Notice of Hearing (NOH). After hearing the evidence, if the Board finds that the price is excessive, it can issue an Order to reduce the price and/or refund the excess revenues. A patentee also has the option of submitting a VCU to resolve the matter after the NOH has issued. Copies of the Act, the Regulations, the Guidelines and the Patentee’s Guide to Reporting are posted on the PMPRB’s website. The PMPRB relies on the patentees’ full and timely disclosure of any and all patented drug products being sold in Canada to which a patent pertains. In 2014, 9 drug products were reported to the PMPRB for the first time even though they were patented and sold prior to 2014. Table 2 lists the drug products that were patented and sold in Canada prior to being reported to the PMPRB. Failure to file refers to the complete or partial failure of a patentee to comply with the regulatory filing requirements outlined in the Act and the Regulations. There were no Board Orders issued for failure to file in 2014. All new patented drug products reported to the PMPRB are subject to a scientific evaluation as part of the price review process. The Human Drug Advisory Panel (HDAP) was established by the Board to provide independent expertise and advice to Board Staff. The Human Drug Advisory Panel conducts a review when a patentee makes a claim regarding therapeutic improvement. Panel members review and evaluate the appropriate scientific information available, including any submission by a patentee with respect to the proposed level of therapeutic improvement, the selection of drug products to be used for comparison purposes and comparable dosage regimens. The PMPRB reviews the average price of each strength of an individual dosage form of each patented medicine. In most cases, this unit is consistent with the Drug Identification Number (DIN) assigned by Health Canada at the time the drug is approved for sale in Canada. For the purpose of this report, a new patented drug product in 2014 is defined as any patented drug product first sold in Canada, or previously sold but first patented, between December 1, 2013, and November 30, 2014. There were 103 new patented drug products for human use reported as sold in 2014. Some are one or more strengths of a new active substance and others are new presentations of existing medicines. Of the 103 new patented drug products, 4 (3.9%) were being sold in Canada prior to the issuance of the Canadian patent that brought them under the PMPRB’s jurisdiction. The table below shows the year of first sale for these drug products. The list of New Patented Medicines Reported to the PMPRB is available on the website under Regulating Prices. This list includes information on the status of the review (e.g., whether the medicine is under review, within the Guidelines, under investigation, or subject to a VCU or Notice of Hearing). Figure 1 illustrates the number of new patented drug products for human use reported to the PMPRB from 1989 to 2014. This is a bar graph depicting the number of new patented drug products for human use reported to the Patented Medicine Prices Review Board by year. In 1989, 68 patented drug products for human use were reported to the PMPRB. In 1990: 74; 1991: 94; 1992: 88; 1993: 77; 1994: 64; 1995: 81; 1996: 80; 1997: 93; 1998: 90; 1999: 111; 2000: 81; 2001: 82; 2002: 98; 2003: 77; 2004: 96; 2005: 68; 2006: 112; 2007: 77; 2008: 83; 2009: 81; 2010: 68; 2011: 109; 2012: 82; 2013: 115; 2014: 103. For a complete list of the 103 new patented drug products and their price review status, see Appendix 2. For the purpose of this report, existing patented drug products include all patented drug products that were first sold and reported to the PMPRB prior to December 1, 2013. A summary of the status of the price review of the new and existing patented drug products for human use in 2014 is provided in Table 4. Reviews of all drug products for human use reported as Under Review in the 2013 Annual Report have been completed. Board Staff reviews the price of a patented over-the-counter drug product or a patented veterinary product when a complaint has been received. No complaints were received in 2014. The PMPRB received several enquiries in 2014 regarding its regulatory activities and the compliance status of patented and non-patented drug products. Board Staff was able to confirm that the patented medicines in question were within the Guidelines. Had the price of the patented drug products been outside the Guidelines, Board Staff would have initiated an investigation. If the price of a drug product is found to be outside the Guidelines, the patentee may submit a VCU for the Chairperson’s approval or the Chairperson may determine that it is in the public interest to hold a public hearing. Once a determination has been made in either case, the outcome is reported on the PMPRB website. A VCU is a written undertaking by a patentee to adjust its price to conform to the Board's Guidelines. Under the Guidelines, patentees are given an opportunity to submit a VCU when Board Staff concludes, following an investigation, that the price set forth by the patentee for a patented drug product sold in Canada appears to have exceeded the Guidelines. A VCU can also be submitted by a patentee after a Notice of Hearing is issued. In 2014, four VCUs were accepted. In addition to price reductions for certain drug products, excess revenues totaling $2,728,804.38 were offset by way of payments to the Government of Canada. In 2015, to date, one VCU was approved by the Chairperson in the Crixivan matter. Patentees are to ensure that the prices of their patented drug products are within the Board’s Guidelines during all periods in which the drug products are under the PMPRB’s jurisdiction. In the event that the price of a patented medicine appears to be excessive, the Board can hold a public hearing. If it finds that the price is excessive, it may issue an order to reduce the price and to offset revenues received as a result of the excessive price. Board decisions may be subject to judicial review in the Federal Court of Canada. In January 2015, the Patented Medicine Prices Review Board announced it would hold a public hearing in the matter of the price of the patented medicine Soliris, and Alexion Pharmaceuticals Inc., the pharmaceutical company that holds the patent for Soliris and sells the medicine in Canada. Soliris is the first and only treatment for patients with Paroxysmal Nocturnal Hemoglobinuria—a rate and life-threatening blood disorder. The purpose of this hearing will be to determine whether the medicine has been or is being sold in any market in Canada at a price that, in the Board's opinion, is or was excessive; and, if so, what order, if any, should be made to remedy the excessive pricing. Two other matters remain before the Board: Apotex Inc. and Apo-Salvent CFC Free. The outcome of these matters will be examined in light of the Federal Court decisions into three other matters: ratio-Salbutamol HFA, ratiopharm and Sandoz on the Board’s jurisdiction. Those decisions are under review in the Federal Court of Appeal. ratio-Salbutamol HFA Asthma ratiopharm Inc. Excess revenues totalling $2,787,722.06 were offset by way of payments to the Government of Canada through VCUs and Board Orders in 2014 up to May 31, 2015. Since 1993, a total of 100 VCUs have been approved and 27 public hearings initiated. These measures resulted in price reductions and the offset of excess revenues by way of additional price reductions and/or payments to the Government of Canada. Over $149 million has been collected through VCUs and Board Orders by way of payments to the Government of Canada and/or to customers such as hospitals and clinics. Three Board decisions had been subject to judicial review by the Federal Court: ratio-Salbutamol HFA (T-1058-11; T-1825-11); ratiopharm Inc. (now Teva Canada) (T-1252-11); and Sandoz Canada Inc. (T-1616-12). The Court heard these matters in November 2013 and released its decisions on May 27, 2014. The Federal Court allowed the applications for judicial review and referred the matters back to the Board with a direction that it find that ratiopharm Inc. and Sandoz Canada Inc. are not patentees. Notices of Appeal for these decisions (ratiopharm Inc. (now Teva Canada) (A-303-14) and Sandoz (A-302-14)) were filed with the Federal Court of Appeal by the Attorney General on June 25, 2014. Overall spending on pharmaceuticals is influenced by many factors, including price, utilization, the market entry of newer, more expensive drugs, and older drugs “going generic”. In 2014, sales of patented drugs increased by 3.1% and Canadian prices remained third highest among the PMPRB’s comparator countries (PMPRB7). Patented drug prices in Canada remain the third highest among the comparator countries. For the second year in a row, Canadian prices are higher than those in France, the UK, Italy, Sweden and Switzerland. In 2014, the increase in patented drug prices was less than the rate of inflation, as measured by the consumer price index (CPI), and therefore, did not contribute to sales growth. Antineoplastics and immunomodulating agents had the greatest impact on sales growth in 2014. Chemotherapy drugs and drugs that affect the immune system accounted for 30.8% of sales in 2014, an increase of 7.4% from last year. Canadian patented drug prices are 6% higher than the international median when US prices are excluded. Although Canadian patented drug prices are below the international median price of the PMPRB comparator countries, if US prices are excluded from the international average, Canadian prices are, on average, 6% higher. Since 2000, growth in drug expenditures in Canada has outpaced the growth in all comparator countries. Canadian drug expenditures increased by 184.43% between 2000 and 2012. This rate of growth was higher than that of all of the PMPRB comparator countries – even the US. The PMPRB is responsible for reporting on trends in pharmaceutical sales and pricing for all medicines and for reporting research and development spending by patentees. In addition, the PMPRB undertakes studies and conducts analysis on a variety of topics related to pharmaceutical pricing and costs. Patentees are required under the Patented Medicines Regulations (Regulations) to submit detailed information on their sales of patented drug products, including quantities sold and net revenues received for each product by class of customer in each province/territory. The PMPRB uses this information to analyze trends in sales, prices and utilization of patented drug products.Footnote 1 This section provides key statistical results from this analysis. Canadians spend much more today on patented drug products than they did a decade ago, but it is important to understand that an increase in drug spending does not in itself imply rising drug prices. For example, the PMPRB's Annual Reports from 1995 through 2003 noted that sales of patented drug products grew at annual rates consistently exceeding 10%, while average annual rates of change for prices were less than 1%. In these instances, sales growth was driven by changes in the volume and composition of drug utilization. Table 7 reports patentees' total sales of patented drug products in Canada for 1990 through 2014. In 2014, sales of patented drug products increased to $13.7 billion from $13.3 billion in 2013, an increase of 3.1%. By comparison, the annual growth in sales was 27.0% in 1999 and remained in double-digits until 2003. The last column of Table 7 gives sales of patented drug products as a share of overall drug sales. This share rose from 43.2% in 1990 to a peak of 72.7% in 2003. It declined over the 2003 to 2009 period, but has been quite stable since. That is, sales of non-patented brand and generic drug products have generally grown at similar rates as the sales of patented drug products in recent years. * The denominator in this ratio comprises sales of patented, non-patented brand and generic drug products. Starting with the estimate for 2005, this value is derived from data contained in the IMS AG MIDAS™ database. In previous years, IMS data were used to calculate sales of generic drug products only, while sales of non-patented brand products were estimated from data submitted by patentees. This approach was abandoned because of anomalies related to year-to-year changes in the set of companies reporting to the PMPRB. Ratios reported for years before 2005 likely overstate the patented share, but by only a small amount. This small bias in no way invalidates the strong upward trend evinced by the results for the years 1990 through 2003. The results in this table show that the increase in total sales that occurred between 2013 and 2014 was the result of two factors: increases in the quantity of existing drug products sold, and strong sales for new drugs, which offset a relatively large exiting drug effect. Figure 2 breaks down 2014 sales of patented drug products according to the year in which the product was first sold in Canada. Throughout the latter part of the 1990s and early 2000s, sales growth was largely driven by a succession of new “blockbuster” products that ultimately achieved very high sales volumes. Despite the recent patent expiries (“patent cliff”), these products still accounted for a considerable share of patented drug sales in 2014. Since mid-2000s, changes in the Canadian pharmaceutical environment, along with a reduction in the rate of introduction of new high-volume products, has resulted in dampened growth. This is a bar graph depicting the share of 2014 sales, in percent, of patented drug products by the year in which the product was first sold in Canada. Drugs introduced before 1995 comprised 3.3% of the share of sales in 2014. In 1995: 1.0; 1996: 1.3; 1997: 1.4; 1998: 3.7; 1999: 5.2; 2000: 0.4; 2001: 2.6; 2002: 7.8; 2003: 5.9; 2004: 7.9; 2005: 7.0; 2006: 8.6; 2007: 6.8; 2008: 7.9; 2009: 5.3; 2010: 5.0; 2011: 10.7; 2012: 3.0; 2013: 3.0; 2014: 2.1. The PMPRB classifies drug products according to the World Health Organization’s (WHO) Anatomical Therapeutic Chemical (ATC) system when it conducts analyses at the level of therapeutic class. This is a hierarchical system that classifies drug products according to their principal therapeutic use and chemical composition. At its first level of aggregation (Level 1), the ATC system classifies drug products according to the element of human anatomy with which they are primarily associated. Table 9 breaks out sales of patented drug products in Canada in 2014 by major therapeutic class, defined by ATC Level 1. The table gives the 2014 sales for each class, the share of the total sales this represents and the rate at which sales grew relative to 2013. Values in the last column represent the component of overall sales growth attributable to drug products in the corresponding therapeutic class.Footnote 4 By this measure, antineoplastics and immunomodulating agents made the largest positive contribution to sales growth. Lower sales of both general antiinfectives for systemic use and antiparasitic products and nervous system drugs also had a significant impact on overall expenditure. * These groups have been combined for reasons of confidentiality. † Values in this column may not add to 100.0 due to rounding. The PMPRB uses the Patented Medicines Price Index (PMPI) to monitor trends in prices of patented drug products. The PMPI measures the average year-over-year change in the ex-factory prices of patented drug products sold in Canada. The index is constructed using a formula that takes a sales-weighted average of price changes observed at the level of individual drug products.Footnote 5 This is similar to the approach Statistics Canada uses to construct the Consumer Price Index (CPI). The PMPI is based on an average transaction price and sales information for a six-month period submitted by patentees. It is important to understand the conceptual relationship between the PMPI and drug costs. The PMPI does not measure changes in the utilization of patented drug products; a quantity index, the , is calculated for this purpose (see Utilization of Patented Drug Products). The PMPI does not measure the cost impact of changes in prescribing patterns or the introduction of new medicines. By design, the PMPI isolates the component of sales growth attributable to changes in prices. Figure 3 provides year-over-year changes in the PMPI for the years 1988 through 2014. As measured by the PMPI, prices of patented drug products were virtually unchanged from 2013 to 2014. This is a bar graph depicting the year-over-year changes, in percent, in the Patented Medicines Price Index (PMPI) for the years 1988 through 2014. In 1988, the rate of change in the PMPI was 4.2. 1989: 1.9; 1990: 2.8; 1991: 3.3; 1992: 2.2; 1993: 0.1; 1994: -0.7; 1995: -1.9; 1996: -2.2; 1997: 0.04; 1998: -0.1; 1999: 0.2; 2000: 0.4; 2001: -0.03; 2002: -0.1; 2003: 0.1; 2004: 0.7; 2005: 0.5; 2006: -0.2; 2007: 0.0; 2008: -0.1; 2009: 0.2; 2010: -0.5; 2011: -0.1; 2012: 0.3; 2013: -0.1; 2014: 0.0. The Patent Act requires the PMPRB to consider changes in the CPI, among other factors, in determining whether the price of a patented drug product is excessive. Figure 4 plots year-over-year rates of change in the PMPI against corresponding changes in the CPI. General price inflation, as measured by the CPI, has exceeded the average increase in patented drug prices almost every year since 1988. In 2014, the CPI rose by 2.0%, while the PMPI was on average unchanged from 2013 to 2014 at 0.0%. This is a line graph depicting the year-over-year rates of change in the Patented Medicines Price Index (PMPI) against corresponding changes in the Consumer Price Index (CPI), in percent. In 1988, the rate of change in the PMPI was 0.041. The rate of change in the CPI was 0.04. 1989: PMPI 0.019, CPI 0.05; 1990: PMPI 0.028, CPI 0.048; 1991: PMPI 0.039, CPI 0.056; 1992: PMPI 0.021, CPI 0.015; 1993: PMPI 0.001, CPI 0.018; 1994: PMPI -0.007, CPI 0.002; 1995: PMPI -0.019, CPI 0.022; 1996: PMPI -0.022, CPI 0.015; 1997: PMPI -0.001, CPI 0.017; 1998: PMPI -0.001, CPI 0.009; 1999: PMPI 0.002, CPI 0.017; 2000: PMPI 0.005, CPI 0.027; 2001: PMPI 0.1, CPI, 2.6; 2002: PMPI -0.012, CPI 0.023; 2003: PMPI 0.001, CPI 0.028; 2004: PMPI 0.007, CPI 0.018; 2005: PMPI 0.005, CPI 0.022; 2006: PMPI -0.002, CPI 0.020; 2007: PMPI 0.000, CPI 0.022; 2008: PMPI 0.002, CPI 0.023; 2009: PMPI 0.003, CPI 0.003; 2010: PMPI -0.004, CPI 0.018; 2011: PMPI -0.001, CPI 0.029; 2012: PMPI 0.003, CPI 0.015; 2013: PMPI -0.001, CPI 0.009; 2014: PMPI 0.000, CPI 0.020. It is not surprising that the PMPI has seldom kept pace with the CPI. The PMPRB's Guidelines allow the price of a patented drug product to rise by no more than the CPI over any three-year period. (The Guidelines also impose a cap on year-over-year price increases equal to one and one-half times the current year rate of CPI inflation.) This effectively establishes CPI inflation as an upper bound on the amount by which individual prices may rise over any three-year period.Footnote 6 Increases in the PMPI normally do not reach this upper bound because many patentees do not raise their prices by the full amount permitted under the Guidelines, or choose to reduce their prices. Figure 5 presents average rates of price change by class of customer.Footnote 8 These results were obtained by applying the PMPI methodology separately to sales data for hospital, pharmacy and wholesale customers.Footnote 9 The 2014 rates of price change for these classes were, respectively, -0.4%, -0.8% and 0.1%. This is a bar graph depicting average rates of price change by class of customer, in percent. In 2011, the average rate of price change for hospitals was -2.3. For pharmacies, it was 0.5. For wholesalers, it was 0.3. 2012: Hospital -1.2, Pharmacy -0.8, Wholesaler 1.3; 2013: Hospital -0.6, Pharmacy 0.4, Wholesaler 1.4; 2014: Hospital -0.4, Pharmacy -0.8, Wholesaler 0.1. Figure 6 presents average annual rates of price change by province/territory, obtained by applying the PMPI methodology to sales data segregated by the province/territory in which the sale occurred. These results indicate that, between 2013 and 2014, prices of patented drug products in PEI fell on average. The largest average price increase occurred in Nova Scotia (0.4%). *Values for Nunavut are included in the Northwest Territories (NWT). †Results for “All” in Figure 6 does not include the class of customer “other”. This is a bar graph depicting average annual rates of price change by province/territory and class of customer in between 2013 and 2014. Does the price of a typical patented drug product change much in the years after it enters the Canadian market? To answer this question, Figure 7 provides the average ratio of the 2014 price to introductory price (the price at which the drug product was sold in its first year on the Canadian market). This is a bar graph that depicts the average ratio of the 2014 price of a typical patented drug product to the introductory price (the price at which the drug product was sold in its first year on the Canadian market). In 1995, the average ratio between the 2014 price to the introductory price is 1.01. In 1996, 1.15; 1997, 1.13; 1998, 1.07; 1999, 1.09; 2000, 1.08; 2001, 1.07; 2002, 1.04; 2003, 1.04; 2004, 1.04; 2005, 1.03; 2006, 1.02; 2007, 1.01; 2008, 1.00; 2009, 0.99; 2010, 0.98; 2011, 0.97; 2012, 0.97; 2013, 0.98. The results in Figure 7 imply no consistent tendency for prices to either rise or fall substantially after introduction, with the average 2014 price of a typical patented drug product being within a few percentage points of its introductory price.Footnote 10 For example, the prices of products introduced a decade ago are only 4% higher in 2014. In accordance with the Act and the Regulations, patentees must report publicly available prices of patented drug products for seven foreign comparator countries (“PMPRB7”): France, Germany, Italy, Sweden, Switzerland, the United Kingdom and the United States. This is a bar graph depicting the average annual rates of price change for Canada and each of the seven comparator countries, in percent. In Canada, the average annual rate of price change was 0.0. France, -2.0; Italy, -0.5; Germany, 2.6; Sweden, -1.1; Switzerland, -3.5; UK, 0.9; US, 16.5. The results in Figure 8 indicate that in 2014, the United States saw prices rise at an average rate of 16.5%. The United Kingdom and Germany saw more modest average price increases, while prices in France, Italy, Switzerland and Sweden declined. The foreign market results are based on publicly available ex-factory gate price information (generally for the retail customer class) submitted by patentees to the PMPRB. The Canadian rate of change, however, is based on the actual average transaction prices and is net of rebates and discounts provided by manufacturers to their direct customers. How much more/less would Canadians have paid for the patented drug products they purchased in 2014 had they paid Country X prices rather than Canadian prices? For example, Table 11 states that the 2014 average French-to-Canadian price ratio was 0.75. This means Canadians would have paid 25% less for the patented drug products they purchased in 2014 had they bought these products at French prices. For many years, the PMPRB has reported average foreign-to-Canadian price ratios with foreign prices converted to their Canadian dollar equivalents by means of market exchange rates. (More exactly, the 36-month moving averages of market rates the PMPRB normally uses in applying its Guidelines.) Table 11 also reports foreign-to-Canadian price ratios with currency conversion at purchasing power parity (PPP). The PPP between any two countries measures their relative costs of living expressed in units of their own currencies. In practice, cost of living is determined by pricing out a standard “basket” of goods and services at the prices prevailing in each country. How much more/less consumption of other goods and services would Canadians have sacrificed for the patented drug products they purchased in 2014 had they lived in Country X? Questions of this type cannot be answered by simply comparing drug prices. Rather, one must first calculate what each price represents in terms of goods and services foregone. PPPs are designed for such purposes. Table 11 provides bilateral comparisons of prices in each of the PMPRB’s seven comparator countries to corresponding Canadian prices. Focusing on the results with currency conversion at market exchange rates, it appears that, as in previous years, Canadian prices were typically within the range of prices observed among the comparator countries. Prices in France, Italy, United Kingdom, Sweden and Switzerland were appreciably lower than Canadian prices, while those in Germany were higher. As in previous years, prices reported for the United States were much higher than prices in Canada or any other comparator country. It is important to note that it is not always possible to find a matching foreign price for each and every patented drug product sold in Canada. Table 11 displays how often an international price comparison was available for each of the comparator countries. For example, out of 1,345 patented drug products under the PMPRB's jurisdiction in 2014, a publicly available ex-factory gate price for France was available only 58% of the time, whereas for the US the number was 82%, by far the highest. Given the integrated nature of the Canadian and US supply chain, it is not uncommon for the US to be the only other country for which a comparator price to a product sold in Canada is available, in which case it is deemed to constitute the international median price as per the PMPRB's methodology. Average price ratios obtained with currency conversion at PPPs tell the same story. When international differences in cost of living are accounted for, it appears Canadians incurred a larger consumption cost for the patented drug products they purchased in 2014 than did residents of every other comparator country except Italy, Germany and the United States. Figure 9 puts these results in historical perspective. In 2005, Canadian prices were, on average, approximately equal to or below corresponding prices in all comparators other than Italy. By 2014, Canadian prices were decidedly above prices in the United Kingdom, France and Italy, and somewhat higher than prices in Sweden and Switzerland. This is a bar graph depicting the average foreign-to-Canadian price ratios in 2005 and 2014. If the patented medicine is being sold in one or more of the comparator countries (PMPRB7), the patentee must report the publicly available ex-factory prices to the PMPRB for each class of customer.Footnote 13 In order to assess how Canada compares to a basket of countries beyond the PMPRB7, Figure 10 uses Canadian and international prices reported in the IMS AG MIDAS™ database at the ex-factory manufacturer level, reflecting all sales to the pharmacy and hospital sectors. The international price comparisons reported in Figure 10 provide a bilateral price comparison using all countries in the Organisation for Economic Co-operation and Development (OECD) available in MIDAS™. The average foreign-to-Canadian price ratios are constructed using exactly the same approach employed to produce the ratios presented in Figure 9. These are Canadian sales-weighted arithmetic averages of the corresponding foreign-to-Canadian price ratios for individual drugs.Footnote 14 As shown below, Canadian prices are on average approximately 26% above the median of the OECD and are fourth highest among the 31 countries. This is a bar graph depicting the average foreign-to-Canadian price ratios of patented drugs in 2014 for OECD countries, using Canadian and international prices reported in the IMS AG MIDAS™ database. United States: 2.21; Mexico: 1.04; Japan: 1.04; Canada: 1.00; Switzerland: 0.98; Germany: 0.96; Chile: 0.90; Sweden: 0.87; New Zealand: 0.86; Austria: 0.82; Australia: 0.80; Ireland: 0.78; Finland: 0.77; median for the OECD: 0.74; Luxembourg: 0.74; Spain: 0.73; Italy: 0.73, France: 0.72; Belgium: 0.72; Great Britain: 0.72; Norway: 0.69; Hungary: 0.68; Slovakia: 0.66; Portugal: 0.66; Netherlands: 0.66; Poland: 0.64; Slovenia: 0.64; Czech Republic: 0.61; Estonia: 0.60; Greece: 0.58; South Korea: 0.46; Turkey: 0.33. Table 12 provides average foreign-to-Canadian price ratios using several multilateral measures of foreign prices. The median international price (MIP) is the median of prices observed among the seven comparator countries. Other multilateral price ratios compare the minimum, maximum and simple mean of foreign prices to their Canadian counterparts. Focusing again on results at market exchange rates, the average MIP-to-Canadian price ratio stood at 1.13 in 2014. (The corresponding value for 2013 was 1.06.) Note that mean foreign prices produce higher foreign-to-Canadian price ratios than do MIPs. This is explained by the influence of US prices, which are typically much higher than prices elsewhere. Although US prices nearly always figure importantly in determining mean foreign price, this is less so when it comes to median international prices. Nevertheless, the US does exercise a significant influence over the average ratio of median international prices relative to Canadian prices because of the not infrequent phenomenon mentioned in the previous section, whereby the US is the only country for which an ex-factory gate price for a patented drug product sold in Canada is available. 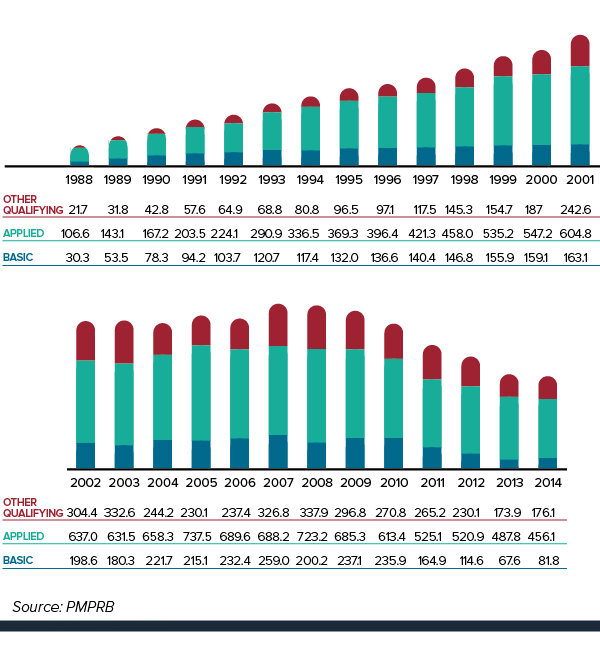 Figure 11 puts these results in historical perspective, giving a history of the average MIP-to-Canadian price ratios from 2001 to 2014. Although there has been considerable movement in the ratio over this period, it has remained above parity. This is a line graph depicting the history of the average MIP-to-Canadian price ratios from 2001 to 2014. In 2001, the average ratio of Median International Price (MIP) to Canadian average translation price, at market exchange rates, was 1.11. In 2002: 1.08; 2003: 1.12; 2004: 1.16; 2005: 1.14; 2006: 1.07; 2007: 1.03; 2008: 1.03; 2009: 1.04; 2010: 1.06; 2011: 1.05; 2012: 1.07; 2013: 1.06; 2014: 1.13. Figure 12 provides alternate results for the average MIP-to-Canadian price ratio at market exchange rates in 2014. To address the previously-raised point that Canadian prices are national average transaction prices whereas foreign prices are list prices, a list price to list price ratio is calculated. Using this method, the average ratio decreases from 1.13 to 1.02. It is important to keep in mind that non-transparent rebates provided directly to payers are currently not captured in this data. To account for the large impact of US prices in determining the mean foreign price, a ratio excluding the US and a ratio including at least five countries in the calculation of the median are also provided in Figure 12. With these restrictions, the average MIP-to-Canadian price ratio drops to 0.85 and 0.86, respectively, suggesting that Canadian list prices are on average 14%-15% higher than median foreign list prices. In many of the comparator countries, discounts off list prices are available to all payers, both public and private. By contrast, a large portion of the Canadian market (over 60%) is in fact paying list prices. This is a bar graph depicting the average ratio of Median International Price (MIP) to Canadian price at market exchange rates, using data from 2014. Figure 13 offers more detail on the product-level MIP-to-Canadian ratios underlying the averages reported in Table 12. This figure distributes the 2014 sales of each patented drug product according to the value of its MIP-to-Canadian price ratio (more exactly, according to the range into which the ratio fell).Footnote 15 These results show substantial dispersion in product-level price ratios: while patented drug products with MIP-to-Canadian price ratios between 0.90 and 1.10 accounted for 25.9% of sales, those with ratios less than 0.90 accounted for 45.6% of sales, and products with ratios exceeding 1.10 accounted for 28.5%. This is a bar graph depicting the distribution of 2014 sales of each patented drug product according to the value of its MIP-to-Canadian price ratio (more exactly, according to the range into which the ratio fell). ‹ 0.50: 3.6; 0.50 to 0.55: 1.3; 0.55 to 0.60: 4.2; 0.60 to 0.65: 4.8; 0.65 to 0.70: 3.1; 0.70 to 0.75: 2.4; 0.75 to 0.80: 3.5; 0.80 to 0.85: 12.0; 0.85 to 0.90: 10.7; 0.90 to 0.95: 8.2; 0.95 to 1.00: 3.5; 1.00 to 1.05: 6.6; 1.05 to 1.10: 7.6; 1.10 to 1.15: 3.5; 1.15 to 1.20: 5.4; 1.20 to 1.25: 1.5; 1.25 to 1.30: 1.2; 1.30 to 1.35: 1.6; 1.35 to 1.40: 0.6; 1.40 to 1.45: 0.9; 1.45 to 1.50: 1.8; › 1.50: 12.2. The price and sales data used to calculate the PMPI also allow the PMPRB to examine trends in the quantities of patented drug products sold in Canada. The PMPRB maintains the Patented Medicines Quantity Index (PMQI) for this purpose. Figure 14 provides average rates of utilization growth, as measured by the , from 1988 through 2014. These results confirm that in recent years, growth in the utilization of patented drug products has been the primary source of rising sales, with rates of utilization growth roughly tracking sales growth. This tracking pattern continued in 2014, with the utilization of patented drug products, on average, increasing by 3.6% between 2013 and 2014 and sales increasing by 3.1%. This is a bar graph depicting average rates of utilization growth, as measured by the Patented Medicines Quantity Index (PMQI), from 1988 through 2014, in percent. 1988: 3.8; 1989: 13.3; 1990: 13.9; 1991: 9.1; 1992: 10.8; 1993: 5.5; 1994: 3.2; 1995: 14.8; 1996: 7.8; 1997: 20.6; 1998: 16.1; 1999: 21.2; 2000: 16.2; 2001: 17.8; 2002: 11.0; 2003: 14.1; 2004: 8.5; 2005: 4.2; 2006: 5.4; 2007: 3.4; 2008: 3.7; 2009: 3.2; 2010: -2.3; 2011: 0.8; 2012: -1.8; 2013: 4.3; 2014 : 3.6. Table 13 provides average rates of utilization growth among patented drug products at the level of major therapeutic classes. The results in this table were obtained by applying the methodology to data segregated by ATC Level I class. As in Table 13, the last column provides an approximate decomposition of overall PMQI change into contributions attributable to each therapeutic class. In 2014, levels of utilization increased in eight therapeutic classes. Modest growth in antineoplastics and immunomodulating agents, alimentary tract and metabolism and sensory organ products accounted for most of the growth in overall utilization. Utilization of drug products in the nervous system, blood and blood forming organs and cardiovascular system declined. IMS HealthFootnote 16 regularly reports on drug sales across a large number of countries. Based on sales data from this source, Figure 15 provides shares of global sales for Canada and each of the seven comparator countries that the PMPRB considers in conducting its price reviews (PMPRB7).Footnote 17 The Canadian market accounted for 2.2% of the global market in 2014. This is a pie chart depicting the distribution of drug sales amont major global markets in 2014. 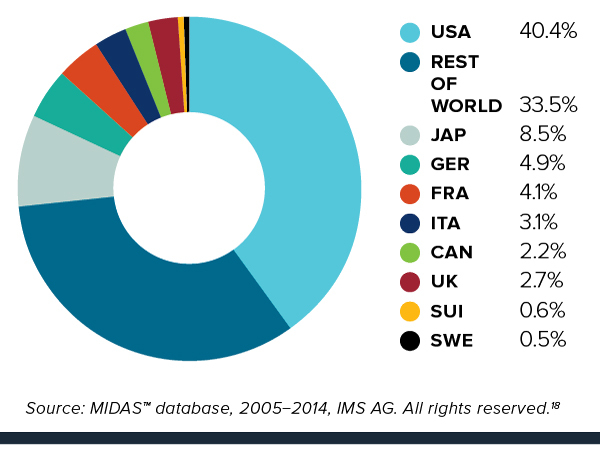 The United States market accounted for 40.4% of the global market in 2014. Japan: 8.5%; Germany: 4.9%; France: 4.1%; Italy: 3.1%; Canada: 2.2%; U.K.: 2.7%; Switzerland: 0.6%; Sweden: 0.5%; the rest of the world: 33.5%. Figure 16 provides Canada’s share of global sales for 2005 to 2014. The Canadian share has remained between 2.2% and 2.7% throughout this period. This is a bar graph depicting Canada’s share of global sales for 2005 to 2014, in percent. 2005: 2.4; 2006: 2.6; 2007: 2.6; 2008: 2.6; 2009: 2.5; 2010: 2.7; 2011: 2.6; 2012: 2.6; 2013: 2.5; 2014: 2.2. Figure 17 gives the average annual rate of growth in total drug sales for Canada and the seven comparator countries, individually and collectively (PMPRB7). From 2005 to 2014, drug sales in Canada rose at an average annual rate of approximately 3.9%. This is less than the average rate of growth in drug sales among the seven comparator countries over the same period. This is a bar graph depicting the annual rate of growth in total drug sales, in percent, for Canada and the seven comparator countries, individually and collectively (PMPRB7), between 2005 and 2014. France: 1.9; Switzerland: 3.3; Sweden: 3.6; Canada: 3.9; Italy: 4.1; Germany: 4.3; PMPRB7: 5.3; UK: 5.7; US: 6.0. Figure 18 compares rates of year-over-year growth in drug sales in Canada and the comparator countries combined (PMPRB7). In 2014, for the fifth consecutive year, sales grew at a slower rate in Canada than in the comparator countries. Figure 18 is a line graph comparing the average annual rate of change in drug sales, at constant 2014 market exchange rates, between Canada and comparator countries combined (PMPRB7), between 2006 and 2014. 2006: Canada 8.0, Comparators 7.1; 2007: Canada 6.9, Comparators 4.6; 2008: Canada 8.6, Comparators 2.4; 2009: Canada 6.6, Comparators 4.8; 2010: Canada 2.0, Comparators 2.8; 2011: Canada -1.0, Comparators 3.0; 2012: Canada -1.8, Comparators -0.9; 2013: Canada 1.6, Comparators 6.7; 2014: Canada 4.7, Comparators 18.8. The proportion of national income allocated to the purchase of drug products provides another way to compare drug costs across countries.Footnote 19 Figure 19 gives drug expenditures as a share of Gross Domestic Product (GDP) for Canada and the seven comparator countries based on data for 2012. Drug expenditures absorbed between 1.0% and 2.0% of the GDP in the seven comparators. The Canadian value (2.0%) rivals the US at the top of this range. This is a bar graph depicting drug expenditures as a share of Gross Domestic Product (GDP), in percent, for Canada and the seven comparator countries based on data for 2012. Switzerland: 1.0; United Kingdom: 1.1; Sweden: 1.2; Italy: 1.6; Germany: 1.6; France: 1.8; Canada: 2.0; United States: 2.0. Table 14 provides a historical perspective on the expenditures-to-GDP ratio. Between 2000 and 2012, drug expenditures in Canada grew at a faster rate than in the United States, at close to twice the rate of GDP growth. Table 15 gives the composition of patentees’ sales by therapeutic class for Canada and the seven comparator countries, individually and as an aggregate (PMPRB7).Footnote 20 The results imply a remarkable degree of similarity across countries. * Values may not add to 100.0 due to rounding. How medications are used — where, by whom and for what — has an impact on the amount that Canadians spend on drugs. The PMPRB contributes to Canada’s understanding of these trends through the National Prescription Drug Utilization Information System (NPDUIS) initiative, generating comprehensive, accurate information to help guide decision making and support continued sustainability of our pharmaceutical system. PMPRB reporting has been relied on by the Council of the Federation as part of the pan-Canadian Pharmaceutical Alliance’s efforts to reduce brand-name and generic prices. NPDUIS provides objective, timely information on a wide variety of topics including generic drug use and cost, new pipeline drugs, opioid use, and key cost drivers in drug plans. The National Prescription Drug Utilization Information System (NPDUIS) is a research initiative established by federal, provincial, and territorial Ministers of Health in September 2001. It is a partnership between the PMPRB and the Canadian Institute for Health Information (CIHI). Its purpose is to provide policy makers and public drug plan managers with critical analyses of price, utilization and cost trends, so that Canada's health care system has more comprehensive and accurate information on how prescription drugs are being used and on sources of cost increases. The NPDUIS Advisory Committee, composed of representatives from public drug plans in British Columbia, Alberta, Saskatchewan, Manitoba, Ontario, New Brunswick, Nova Scotia, Prince Edward Island, Newfoundland and Labrador, Yukon, and Health Canada, advises the PMPRB on its research agenda and on individual studies. The Committee also includes observers from CIHI and the Canadian Agency for Drugs and Technologies in Health (CADTH). Synopses of the two most recent reports are provided below. 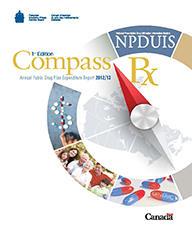 CompassRx is a flagship annual report and the first of its kind to identify the major factors driving prescription drug expenditures in public drug plans in Canada— an important element in allowing policy makers and researchers to understand current trends and anticipate future cost pressures and expenditure levels. This report is an essential tool for anyone interested in an in depth analysis of drug expenditures. The first edition covers public drug plan expenditures in 2012/13. In 2012/13, prescription drug expenditures in the select public drug plans totaled $7.7 billion. This was composed of drug costs (74.4%), pharmacy dispensing costs (21.4%) and pharmacy markups (4.2%). Data source: National Prescription Drug Utilization Information System Database, Canadian Institute for Health Information. Results presented for a select number of public drug plans with available data: Alberta, Saskatchewan, Manitoba, Ontario, New Brunswick, Nova Scotia, Prince Edward Island and Health Canada’s Non-Insured Health Benefits drug plan. This image breaks down the $7.7 billion in prescription drug expenditures for the select public drug plans in 2012/13 into its component parts. Drug costs represented 74.4% of the total expenditures, a decrease of 0.8% from the previous year. Dispensing costs represented 21.4% of the total expenditures, an increase of 5.8% from the previous year. Markups represented 4.2% of the total expenditures for 2012/13. The select public drug plans paid 82.0% of the overall prescription drug expenditure level, with the remaining share being paid by the drug plan beneficiaries either out-of-pocket or through a third-party private insurer. The rates of change in the drug cost component of prescription drug expenditures in public drug plans have been steadily declining in recent years, with overall cost levels decreasing in 2012/13 by 0.8% compared to 2011/12. The low net rate of change was driven by opposing “push” (increasing) effects and “pull” (decreasing) effects which nearly off-set each other. The demographic, volume and drug-mix effects had an important “push” effect, and in the absence of generic savings, they would have increased drug cost levels by 8.5% in 2012/13. The generic price change and substitution effects had an important “pull” effect, and in the absence of other cost pressures, they would have decreased drug cost levels by 9.2% in 2012/13. Note: Values may not add to totals due to rounding and the cross effect. This diagram illustrates drug cost drivers for 2012/13, breaking them out into push (increasing) and pull (decreasing) effects. It shows the totals for the select public drug plans in Canada. 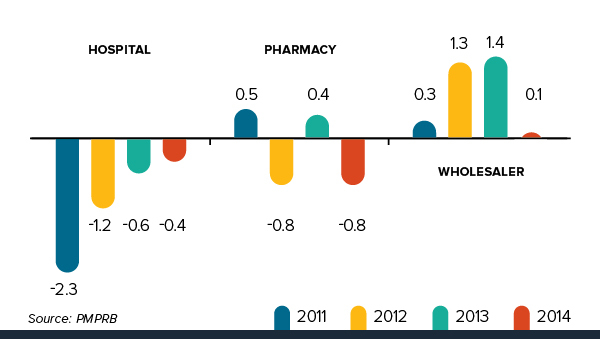 The overall net change in drug costs from 2011/12 to 2012/13 was -0.8%. The rate of growth in the cost of biologics was 19.6%. The number of active beneficiaries with over $10,000 in annual prescription costs has been increasing and accounted for 1.3% of beneficiaries and 20.6% of expenditures. The average annual costs for seniors have been decreasing, while the average annual costs for non-seniors have increased markedly in many provinces. The volume effect (1.7%) due to the increased use of drugs. The demographic effect (2.7%) due to the growth in the active beneficiary population. Generic market share has increased in all plans, capturing 62.3% of the prescriptions in 2012/13. The top five new generic entrants alone generated 3.0% in cost savings in 2012/13. Many provinces implemented generic pricing policies in 2012/13. By 2012/13, generic price reductions ranged from 38% to 16%, depending on the province. A cross effect resulted from the interaction between the individual effects. No value is given for the cross effect. 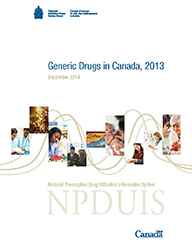 Generic Drugs in Canada, 2013 is one of several reports the PMPRB has produced in recent years, comparing the price of generic drugs in Canada with those in other industrialized countries. It reports on the 2013 generic drug prices and highlights the changes in Canadian generic pricing that have taken place since 2011. The price of generic drugs in Canada is a critical issue for drug plan managers, policy makers and consumers. Canadian manufacturer prices for generic drugs have fallen markedly relative to their branded counterparts in recent years, with reductions in the relative price levels ranging from 56% of the brand price in the first quarter of 2011 to 31% in the second quarter of 2013, based on Ontario data. Despite a significant reduction in Canadian generic drug prices in recent years, they remain appreciably higher than international levels. In 2011, international generic prices were, on average, 35% lower than Canadian prices; by 2013, they were still 32% lower. 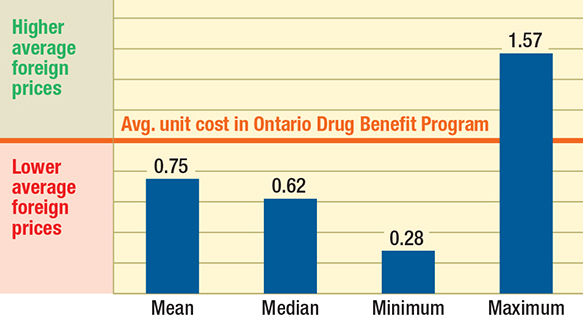 The results based on prices available to the Ontario Drug Benefit Program in the second quarter of 2013, which are presumed to be more reflective of price reductions resulting from the early phase of the Value Price Initiative, reduce the price gap and are a marked improvement. The gap between foreign and Canadian generic prices was the widest (38%–39%) for drugs with a greater number of suppliers competing in the Canadian marketplace (six or more suppliers) and for drugs with greater sales ($10 million or more). This bar graph compares average generic drug prices in Canada and Ontario to brand-name prices. 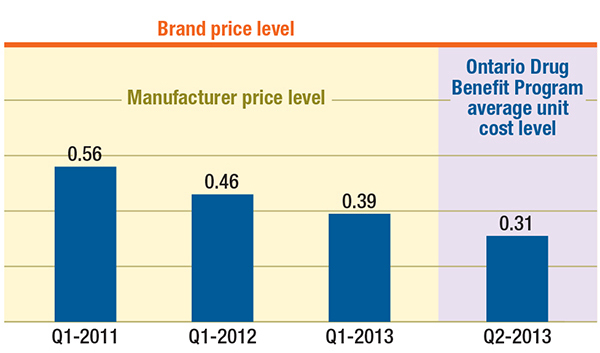 For Canada: Q1-2011 generics were 0.56 of brand prices; Q1-2012 0.46; Q1-2013 0.39. Ontario: Q2-2013 0.31. Source: MIDAS™, January–March 2011 and January–March 2013, IMS AG All Rights Reserved. This bar graph compares average international generic price levels to Ontario levels for Q2-2013. International prices: mean is 0.75; median is 0.62; minimum is 0.28; maximum is 1.57. Innovation is vital to advancing health care. In part, the provisions of Canada’s Patent Act are intended to foster an investment climate favorable to pharmaceutical research and development (R&D) in Canada. However, the percentage of R&D-to-sales by pharmaceutical patentees in Canada has been falling since the late 1990’s and has been under the agreed-upon target of 10% since 2003. In 2014, it was at 4.4% for all patentees and 5.0% for members of Canada’s Research-Based Pharmaceutical Companies (Rx&D), its lowest point since the PMPRB began reporting on R&D in 1988. Canada has been consistently in the top 10 global markets for pharmaceuticals. Despite this, average R&D-to-sales ratios are 3 times higher for the PMPRB comparator countries, whereas prices in the majority of these countries are lower. This represents a 166% decrease from a peak of 11.7% in 1995. The Patent Act (Act) mandates the PMPRB to monitor and report on pharmaceutical research and development (R&D) spending (while giving the PMPRB no regulatory authority to consider the amount or type of patentees' research spending in the context of its price regulation). This chapter provides key statistics on the current state of pharmaceutical research investment in Canada. The statistical results presented in this report were entirely derived from data that patentees submitted to the PMPRB. The Act requires each patentee to report its total gross revenues from sales of all drugs for human or veterinary use (including revenues from sales of non-patented drug products and from licensing agreements) and R&D expenditures in Canada related to medicines (both patented and non-patented for human or veterinary use). Patentees transmit this information to the PMPRB by means of its Form 3 (Revenues and Research and Development Expenditures Provided Pursuant to subsection 88(1) of the Patent Act). The Patented Medicines Regulations (Regulations) require that each submitted Form 3 be accompanied by a certificate stating the information it contains is “true and correct”. The Board does not audit Form 3 submissions, but it does review submitted data for anomalies and inconsistencies, seeking corrections or clarifications from patentees where necessary. To confirm that PMPRB staff has correctly interpreted the data submitted, each patentee is given the opportunity to review and confirm the accuracy of its own R&D-to-sales ratio before that ratio is published. It is a patentee's responsibility to ensure a complete and accurate Form 3 is filed within the time frame set out in the Regulations. If a patentee fails to meet these filing requirements, the Board may issue an Order demanding compliance. There were no such Board Orders issued for the 2014 reporting period. Note that companies without sales of patented medicines do not need to report their R&D expenditures to the PMPRB. This has two implications. First, the statistical results reported here should not be taken to cover all pharmaceutical research conducted in Canada. For example, a company may sell only non-patented drug products but may still perform considerable research in Canada. Similarly, a company may conduct research and have no product sales at all.Footnote 22 The results presented below will not reflect the R&D expenditures of firms in either situation. Second, as new patented drug products come onto the Canadian market and existing patents expire, the number and identity of companies required to file R&D data may change from year to year. A total of 75 companies reported on their R&D activity in 2014. Of these, 35 were members of Canada's Research-Based Pharmaceutical Companies (Rx&D). For reporting purposes, sales revenues are defined as total gross revenues from sales in Canada of all drug products and from licensing agreements (e.g., royalties and fees accruing to the patentee related to sales in Canada by licensees). Pursuant to section 6 of the Regulations, patentees are required to report R&D expenditures that would have qualified for an investment tax credit in respect to scientific research and experimental development (SR&ED) under the provisions of the Income Tax Act that came into effect on December 1, 1987.Footnote 23 By this definition, R&D expenditures may include current expenditures, capital equipment costs and allowable depreciation expenses. Market research, sales promotions, quality control or routine testing of materials, devices or products and routine data collection are not eligible for an investment tax credit and, therefore, are not to be included in the R&D expenditures reported by patentees. Table 16 provides an overview of reported sales revenues and R&D expenditures over the period 1988 through 2014. Patentees reported R&D expenditures of $739.2 million in 2014, a decrease of 1.8% over 2013. Rx&D members reported R&D expenditures of $658.7 million in 2014, an increase of 1.0% over last year. Rx&D members accounted for 89.1% of all reported R&D expenditures in 2014. Table 16 and Figure 20 also provide ratios of R&D expenditures to sales revenues. It should be noted in this context that, with the adoption of the 1987 amendments to the Act, Rx&D made a public commitment to increase their annual R&D expenditures to 10% of sales revenues by 1996.Footnote 24 This level of R&D expenditure was obtained by 1993, with the ratio exceeding 10% in some years. However, since 2003, R&D-to-sales ratios for all patentees and for Rx&D members have declined. Figure 20 is a line graph comparing the R&D-to-sales ratio of all patentees vs. Rx&D patentees based on data collected between 1988 and 2014. Rx&D Patentees: 1988, 6.5; 1989, 8.1; 1990, 9.2; 1991, 9.6; 1992, 9.8; 1993, 10.7; 1994, 11.6; 1995, 12.5; 1996, 12.3; 1997, 12.9; 1998, 12.7; 1999, 11.3; 2000, 10.6; 2001, 10.6; 2002, 10; 2003, 9.1; 2004, 8.5; 2005, 8.8; 2006, 8.5; 2007, 8.9; 2008, 8.9; 2009, 8.2; 2010, 8.2; 2011, 6.7; 2012, 6.6; 2013, 5.4; 2014, 5. All Patentees: 1988, 6.1; 1989, 8.2; 1990, 9.3; 1991, 9.7; 1992, 9.9; 1993, 10.6; 1994, 11.3; 1995, 11.7; 1996, 11.4; 1997, 11.5; 1998, 11.5; 1999, 10.8; 2000, 10.1; 2001, 9.9; 2002, 9.9; 2003, 8.8; 2004, 8.3; 2005, 8.7; 2006, 8.1; 2007, 8.3; 2008, 8.1; 2009, 7.5; 2010, 6.9; 2011, 5.6; 2012, 5.3; 2013, 4.5; 2014, 4.4. The ratio of R&D expenditures to sales revenues among all patentees was 4.4% in 2014, down from 4.5% in 2013. These values are below figures last observed in 1988. The overall R&D-to-sales ratio has been less than 10% for the past 14 consecutive years. The corresponding R&D-to-sales ratio for members of Rx&D was 5.0% in 2014, down from 5.4% in 2013.Footnote 25 These values are close to figures last observed in 1988. The Rx&D ratio has been less than 10% for the past 12 consecutive years. Table 21 in Appendix 3 provides details on the range of 2014 R&D-to-sales ratios. Of the 75 companies reporting in 2014, 89.3% had R&D-to-sales ratios below 10%. Table 17 and Figure 21 (as well as Figure 23 in Appendix 3) provide information on the allocation of 2014 current R&D expendituresFootnote 26 among basic and applied research and other qualifying R&D.Footnote 27 Patentees reported spending $81.8 million on basic research in 2014, representing 11.5% of current R&D expenditures and an increase of 21.0% over the previous year. Patentees reported spending $456.1 million on applied research, representing 63.9% of current R&D expenditures. Clinical trials accounted for 69.7% of applied research expenditures. This is a vertical stacked bar graph that depicts current R&D expenditures by type of research, based on data collected between 1988 and 2014, in percent. In 1988, basic types of research accounted for 19.1% of R&D expenditures. Applied types of research accounted for 67.2% of R&D expenditures. Other qualifying types of research accounted for 13.7% of R&D expenditures. Patentees report expenditures on research they conduct themselves (intramural) and research performed by other establishments, such as universities, hospitals and other manufacturers (extramural). Table 18 shows that 48.9% of 2014 current research expenditures were intramural. Research performed by other companies on behalf of patentees was 25.0% of current expenditures, while research conducted in universities and hospitals accounted for 15.0%. Table 19 provides information on the sources of funds used by patentees to finance their R&D activity. Internal company funds remained by far the single largest source of funding in 2014, accounting for 87.9% of current expenditures. Funds received from government amounted to 1.3% of current expenditures. Table 20 (as well as Table 23 and Table 24 in Appendix 3) show current R&D expenditures by region. As in previous years, current expenditures were heavily concentrated in Ontario and Quebec in 2014, with these provinces accounting for 81.2% of total expenditures. While current R&D expenditures increased at a year-over-year rate of 21.5% in Western Canada, they increased by only 6.7% in Ontario and decreased in Quebec by 19.1%. 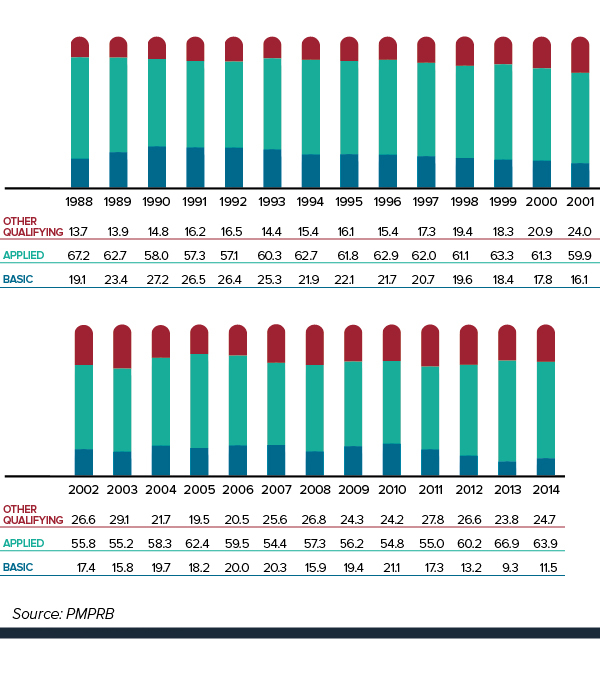 Figure 22 compares Canadian pharmaceutical R&D-to-sales ratios for the years 2000 and 2012 to those in the PMPRB’s seven comparator countries.Footnote 28 Canada’s ratio stood at 10.1% in 2000. Only Italy, at 6.2%, had a lower ratio in that year, while Switzerland had the highest ratio at 102.5%. In 2012, Canada remained at the bottom of the range at 5.3%, with Italy second lowest at 6.1%. Ratios in all other comparator countries remained well above Canada’s ratio. The ratio obtained by aggregating R&D spending and sales across all seven comparator countries was 21.8%, three and a half times the value obtained for Canada. This is a bar graph depicting R&D-to-sales ratios between Canada and comparator countries in 2000 and 2012. The R&D-to-sales ratios represented in Figure 22 may be compared to the average bilateral price ratios reported in Table 11 (see Comparison of Canadian Prices to Foreign Prices section). Several comparator countries, which have patented drug prices that are, on average, substantially less than prices in Canada, have achieved R&D-to-sales ratios well above those in Canada. As noted in last year’s report, there are a multitude of factors that drive the location of pharmaceutical R&D. These include where companies can find the best science base at reasonable cost and ready access to a quality clinical trials infrastructure. Although price levels are often cited as an important policy lever for attracting R&D, the data has not supported this link domestically or internationally. For more detailed information and definitions please refer to the Patent Act, the Patented Medicines Regulations, the PMPRB Compendium of Policies, Guidelines and Procedures, and the Food and Drug Regulations, or contact the PMPRB. Chemical or biological substance responsible for the claimed pharmacologic effect of a drug product. A non-binding advance ruling certificate may be issued pursuant to subsection 98(4) of the Patent Act at the request of a patentee when the Board is satisfied that the price or proposed price of the medicine would not exceed the maximum non-excessive price under the Board's Guidelines. Anatomical Therapeutic Chemical (ATC) classification system, developed and maintained by the World Health Organization (WHO) Collaborating Centre for Drug Statistics Methodology, divides drugs into different groups according to their site of action and therapeutic and chemical characteristics. This system is used by the PMPRB as a guide for selecting comparable medicines for purposes of price review. A practice whereby a patentee notifies the Commissioner of Patents that it has surrendered its rights and entitlements flowing from the patent for the benefit of the public to use and enjoy. NB: As of January 30, 1995, the Board does not recognize dedication of patent as a means to remove the medicine from its jurisdiction. A registration number (drug identification number) that the Health Products and Food Branch of Health Canada assigns to each prescription and non-prescription drug product marketed under the Food and Drugs Regulations. The DIN is assigned using information in the following areas: manufacturer of the product; active ingredient(s); strength of active ingredient(s); pharmaceutical dosage form; brand/trade name; and route of administration. A particular presentation of a medicine characterized by its pharmaceutical dosage form and the strength of the active ingredient(s). The complete or partial failure of a patentee to comply with regulatory filing requirements pursuant to the Patent Act and the Patented Medicines Regulations. The complete failure of a patentee to have reported a patented drug product being sold in accordance with regulatory filing requirements pursuant to the Patent Act and the Patented Medicines Regulations. A drug product with the same active ingredient, strength and dosage form of a brand name drug product. A contractual agreement between a patent holder and a licensee under which the licensee is entitled to enjoy the benefit of the patent or to exercise any rights in relation to the patent for some consideration (i.e., royalties in the form of a share of the licensee's sales). Any substance or mixture of substances made by any means, whether produced biologically, chemically, or otherwise, that is applied or administered in vivo in humans or in animals to aid in the diagnosis, treatment, mitigation or prevention of disease, symptoms, disorders, abnormal physical states, or modifying organic functions in humans and or animals, however administered. For greater certainty, this definition includes vaccines, topical preparations, anaesthetics and diagnostic products used in vivo, regardless of delivery mechanism (e.g., transdermal, capsule form, injectable, inhaler, etc.). This definition excludes medical devices, in vitro diagnostic products and disinfectants that are not used in vivo. Means a notice issued under section C.08.004 or C.08.004.01 of the Food and Drug Regulations. The issuance of an NOC indicates that a drug product meets the required Health Canada standards for use in humans or animals and that the product is approved for sale in Canada. An instrument issued by the Commissioner of Patents in the form of letters patent for an invention that provides its holder with a monopoly limited in time, for the claims made within the patent. A patent gives its holder and its legal representatives, the exclusive right of making, constructing and using the invention and selling it to others to be used. The PMPI was developed by the PMPRB as a measure of average year-over-year change in the transaction prices of patented drug products sold in Canada, based on the price and sales information reported by patentees. An application for a patent that has not yet been issued. Basic or applied research for the purpose of creating new, or improving existing, materials, devices, products or processes (e.g., manufacturing processes). R&D directed toward a specific practical application, comprising research intended to improve manufacturing processes, pre-clinical trials and clinical trials. Includes eligible research and development expenditures that cannot be classified into any of the preceding categories of “type of research and development”. It includes drug regulation submissions, bioavailability studies and Phase IV clinical trials. For the purposes of the Patented Medicines Regulations, in particular Sections 5 and 6, research and development includes activities for which expenditures would have qualified for the investment tax credit for scientific research and experimental development under the Income Tax Act as it read on December 1, 1987. Consist of the following non-capital expenses that are directly related to research work: (a) wages and salaries, (b) direct material, (c) contractors and subcontractors, (d) other direct costs such as factory overhead, (e) payments to designated institutions, (f) payments to granting councils, and (g) payments to other organizations. These elements are described in greater detail in the Patentees' Guide to Reporting— Form 3, available from the PMPRB Website under Regulatory Filings. A program operated by Health Canada to give practitioners access to drugs that are not approved or otherwise available for sale in Canada. A written undertaking by a patentee to adjust its price to comply to the Board's Guidelines. The Chairperson may accept a VCU in lieu of issuing a Notice of Hearing if it is in the public interest. A VCU can also be submitted following the issuance of a Notice of Hearing. A VCU submitted at this point must be approved by the Board Hearing Panel struck to hear the matter. The Board reports publicly on all VCUs accepted by the Chairperson or the Board. This is a vertical stacked bar graph depicting the current R&D expenditures, in millions of dollars, by type of research, based on data collected between 1988 and 2014. 1 To avoid double counting of sales revenues, revenues from royalties are included in calculating each company’s ratio but not included in calculating industry-wide ratios. Federal and provincial government grants are subtracted from the R&D expenditure in calculating individual R&D-to-sales ratios but are included in calculating industry-wide ratios. Differences between the list of firms filing data on prices and those filing R&D data are due to differences in reporting practices of patentees and their affiliates or licensees. Note as well that some veterinary patentees (i.e., those without revenue from sales of products for human use) are required to file information on R&D expenditure but not price and sales information. 4 Spin-off of Abbott’s proprietary products division into a separate legal entity effective Oct. 31, 2012. 5 Not a patentee in 2013. 6 Formerly known as Fujisawa Canada Inc.
7 Formerly known as Aventis Pasteur Ltd.
8 Formerly known as Aventis Pharma Inc.
9 Formerly known as ICN Canada Ltd. The percentage under each R&D category gives the percentage of all money spent in that category in that province. Expenditures as a percentage of total means percentage of R&D expenditures in that province compared to total R&D in Canada. Rows and columns may not equal totals due to rounding. Current expenditures plus capital expenditures (equipment + depreciation) = total R&D expenditures. All statistical results for patented drug products reported in this chapter are based on data submitted by patentees as of April 2015. On occasion, patentees report revisions to previously submitted data or provide data not previously submitted. New data of this sort can appreciably affect the statistics in this chapter. To account for this possibility, the PMPRB has adopted the practice of reporting recalculated sales figures (see Trends in Sales of Patented Drug Products), price and quantity indices (see Price Trends and Utilization of Patented Drug Products) and foreign-to-Canadian price ratios (see Comparison of Canadian Prices to Foreign Prices) for the five years preceding the current Annual Report year. All such recalculated values reflect currently available data. Consequently, where data revisions have occurred, values reported here may differ from those presented in earlier Annual Reports. Although based in part on data obtained under license from the IMS AG MIDAS™ database, the statements, findings, conclusions, views and opinions expressed in this Annual Report are exclusively those of the PMPRB and are not attributable to IMS AG. py(i) is the price of drug i in year y, qy(i) is the physical volume of drug i sold in year y and Σ signifies summation over the set of drug products that were under the PMPRB’s jurisdiction in both 2013 and 2014. The left-hand side of this equation represents the change in total sales of such products between 2013 and 2014. The three terms of the right-hand side define the volume, price and cross effects, respectively, reported in Table 8. This is obtained as the ratio of the year-over-year change in the dollar value of sales for the therapeutic class in question to the change in sales across all patented drug products. These calculations are performed at the level defined by Health Canada’s Drug Identification Number (DIN). Each DIN represents a unique combination of active ingredient(s), dosage form, strength(s), brand and manufacturer. It is possible for individual prices (or, for that matter, the PMPI) to rise by more than the CPI in a given year. This can occur when patentees have banked price adjustments in the preceding years. It can also occur when the forecast rate of CPI inflation exceeds the actual rate. where w(i) represents the share of therapeutic class i in the sales of patented drug products. This relationship provides the basis for the decomposition in the last column of Table 10. Each term on its right-hand-side multiplies the average rate of price change for a given therapeutic class by its share of overall sales. The resulting value is readily interpreted as the contribution of the corresponding class to the change in the overall PMPI. Note that the size of this contribution depends on both the rate of price change specific to the class and its relative importance, as measured by its share of sales. The decomposition in Table 10 is approximate. This is because the weights used to calculate the contribution of each therapeutic class are based on annual sales data, whereas rates of price change (whether overall or by therapeutic class) are calculated from data covering six-month reporting periods. The resulting discrepancy is normally small. Sales of patented drug products are dominated by sales to wholesalers, which accounted for 80.1% of all sales in 2014. Sales to hospitals accounted for another 7.8%, while direct sales to pharmacies accounted for 4.3%. The pharmacy share has fallen precipitously since 2001, when it stood at 20.1%. Results for a fourth class of customer, “Others”, are not provided. This class accounted for about 7.8% of patented drug sales in 2014. Buyers in this class are principally health care institutions other than hospitals, such as clinics and nursing homes. It also includes direct sales to governments. The composition of this class is thought to vary substantially from one year to the next, rendering any analysis of price change in this class of limited value. It must be emphasized that this statement refers to the behaviour of prices on average. There may be instances where individual prices have risen or fallen substantially since introduction. The pharmaceutical industry in the US has argued that the publicly available prices in that country do not reflect actual prices because of confidential discounts and rebates. Effective January 2000, and following public consultation, the PMPRB began including prices listed in the US Federal Supply Schedule (FSS) in calculating the average US price of patented drug products. The FSS prices are negotiated between manufacturers and the US Department of Veterans' Affairs. They are typically less than other publicly available US prices reported to the PMPRB by patentees. The number of drug products and sales these ratios encompass vary because it is not always possible to find a matching foreign price for each patented drug product sold in Canada. Note that all of the bilateral average price ratios reported in Table 11 combined represent at least 80% of 2014 Canadian sales, while the multilateral ratios in Table 12 cover over 98%. The publicly available ex-factory price includes any price of a patented medicine that is agreed on by the patentee and the appropriate regulatory authority of the country. The IMS AG MIDAS™ database is the source of sales data used in this analysis. MIDAS™ summarizes data obtained from IMS AG’s detailed audits of pharmaceutical purchases. MIDAS™ contains information on sales of individual products, measured in both currency and physical units. It also includes information on product manufacturer, active ingredient, brand, form, strength, pack-size, patent status and therapeutic class. Sales estimates are based directly on the purchase information obtained in its pharmacy audits. To obtain the value of a company’s ex-factory sales of a particular product, IMS AG removes an estimate of wholesalers’ mark-ups from the acquisition costs reported. It should be noted that the acquisition costs used by IMS AG are based on invoiced prices. Off-invoice discounts, free goods and other forms of price reduction such as rebates are therefore not represented in the MIDAS™ data. To produce the results represented in this figure, foreign prices were converted to their Canadian-dollar equivalents at market exchange rates. Most of the statistical results presented in this section are based on sales data from the MIDAS™ database, 2005–2014, IMS AG. All rights reserved. These data cover the pharmacy and hospital sectors. The results given in Figures 15 through 18 are based on estimates of ex-factory sales revenues encompassing patented, non-patented branded and generic drug products. These estimates have been converted to Canadian dollar equivalents at annual average market exchange rates. Fluctuations in these rates can substantially influence these shares. Comparisons made on this basis will reflect international differences in prices, overall utilization and patterns of therapeutic choice, as well as differences in national income. Note that the data used to produce Table 15 encompass patented, non-patented branded and generic drug products. Hence, the results reported here for Canada are not directly comparable to those reported in Table 9, which encompass only patented drug products. In order to make use of the best and most up-to-date available drug expenditure data from the OECD, the GDP in Table 14 was calculated using the Purchasing Power Parity (PPP). Due to the fact that PPPs are corrected for relative cost of living based on a standard basket of goods, the GDP growth rates reported in Table 14 are different than those that would be generated using other methodologies. For further details on the Purchasing Power Parity, please see the explanation associated with Table 11. This is likely the situation for much of Canada’s biotechnology sector. Note, however, that if a patentee commissions research from another company specializing in biotechnology research, the patentee should normally include this among the research expenditures that it reports to the PMPRB. Budget 2012 proposed reductions to the Scientific Research and Experimental Development (SR&ED) tax credit and new restrictions on deductions. It also introduced new measures to support innovation and R&D. As per the Regulations, the PMPRB defines R&D based on the 1987 SR&ED definition. As published in the Regulatory Impact Assessment Statement (RIAS) of the Patented Medicines Regulations, 1988, published in the Canada Gazette, Part II, Vol. 122, No. 20 – SOR/DORS/88-474. The R&D-to-sales ratios presented in Table 16 include research expenditures funded by government grants. If the government-funded component is excluded, the ratios for all patentees and for the members of Rx&D in 2014 are 4.3% and 4.9%, respectively. Current R&D expenditures consist of non-capital expenses directly related to research, including (a) wages and salaries; (b) direct material; (c) contractors and sub-contractors; (d) other direct costs such as factory overhead; (e) payments to designated institutions; (f) payments to granting councils; and (g) payments to other organizations. These elements are described in more detail in Form 3 (Revenues and Research and Development Expenditures) available from the PMPRB website. Current R&D expenditures accounted for 96.6% of total R&D expenditure in 2014, while capital equipment costs and allowable depreciation expenses made up 1.9% and 1.4%, respectively. “Basic research” is defined as work that advances scientific knowledge without a specific application in mind. “Applied research” is directed toward a specific practical application, comprising research intended to improve manufacturing processes, pre-clinical trials and clinical trials. “Other qualifying research” includes drug regulation submissions, bioavailability studies and Phase IV clinical trials. Sales in Figure 22 represent domestic sales and do not include exports.